LANSING, Mich. - The Lansing Lugnuts' Bo Bichette has been voted the Midwest League's Most Valuable Player and Prospect of the Year for the 2017 season, as selected by the league's field managers, the MWL announced Friday. Bichette, 19, becomes the fourth Lugnut to be honored as the league MVP, joining Brian Dopirak (2004), Kevin Pillar (2012) and Ryan McBroom (2015). He is the third Nut to be honored as Prospect of the Year, following Corey Patterson (1999) and Brian Dopirak (2004). Drafted 66th overall in 2016, Bichette batted a MLB/MiLB-leading .384 in 70 games for the Lugnuts before a July 10th promotion to A-Advanced Dunedin. At the time of his promotion, he topped the Midwest League in batting average, hits (109), doubles (32), extra-base hits (45), total bases (177), on-base percentage (.448) and slugging percentage (.623). Guerrero, 18, was also promoted to Dunedin on July 10th, leading the Midwest League at the time in strikeout/PA ratio and ranking second in on-base percentage and third in hits, walks and runs scored. In 71 games with the Lugnuts, he batted .316, bashing 21 doubles, one triple and seven homers, and collecting 40 walks compared to 34 strikeouts. The Lansing Lugnuts open a four-game homestand with the South Bend Cubs tonight at 7:05 p.m., a Family Faith Night with postgame LAFCU Fireworks. 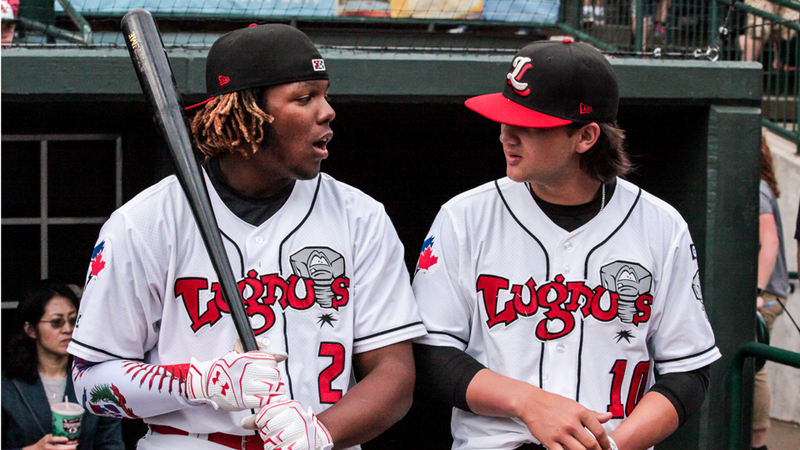 Lugnuts right-hander Osman Gutierrez (4-10, 7.88) takes on Cubs southpaw Manuel Rondon (11-6, 4.85). Tickets may be purchased at the Cooley Law School Stadium box office, by calling (517) 485-4500 or via lansinglugnuts.com.